We tried Baby Warren on the Fisher Price rocker today. Lo and Behold! He loved it! He wasn’t crying and he was sleeping peacefully and calmly all through out. Amazing! For the past few days, we would have to cradle him for him to sleep through and through but when we placed him in the rocker, he slept for 2 hours straight. 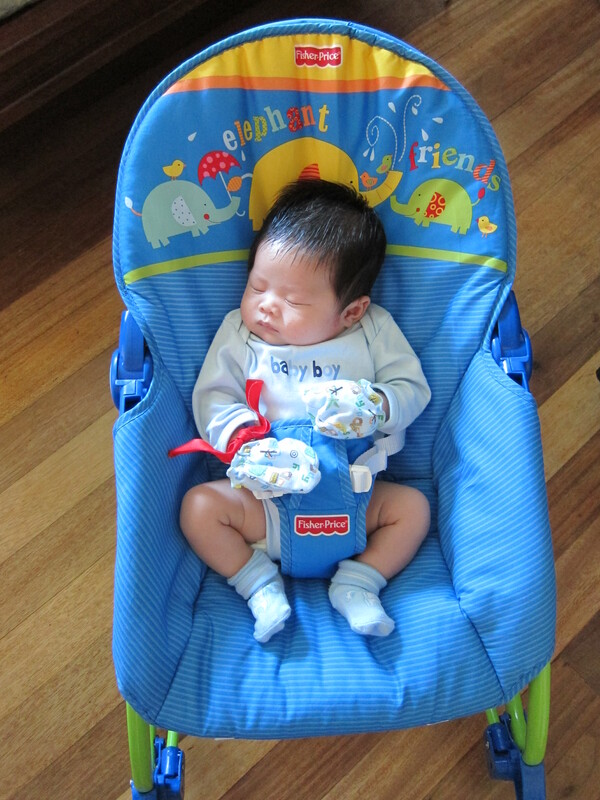 Also, when we transferred him to the crib, he was able to sleep for another hour straight. When he was awake, the toys kept him busy as well. He was firmly looking at them without crying. I bought the Fisher Price Rocker (Infant to Toddler) through Amazon and got them shipped out through my sister-in-law. We initially tried this when Warren was 2 weeks old but I felt that he was still too small. But now at 10lbs more or less, he was securely held on by the rocker. We have only tried 1 out of the 3 possible positions of the rocker. We will be putting batteries later so that it will play music and have calming vibrations. I think the rocker is selling for PHP5500.00 here. We bought it at 30 – 40% of its price through Amazon.